It's big. It's back. It's Smoky not Smudgy 2011! This charity event has grown from strength to strength each year, and it's a unique opportunity to enjoy some pampering treats, and also see some of your favourite brands and companies that usually only have an online presence. Huda: One of my friends was heading Charity Week at Imperial College and we were sitting around discussing what possible events we should hold, when I suggested a pampering event for girls. Another friend said she had a friend who was a Bobbi Brown make-up artist and we took it from there. I always aim high, so this event had to have it all: hairdressers, make-up artists, henna artists, photo shoots, master-classes and so on. The only problem was we didn’t know anyone who would be ready to take on that responsibility and organize an event, ready for Charity Week in 2 weeks time. My friend tried to persuade me to do it, and although I’m the sort of person who can’t tell the difference between blusher and eye shadow (I still don’t know how to use them), I agreed. This was a chance for Imperial to try something new that could potentially be quite instrumental in raising a lot of money for charity. The following two weeks were probably the most intense times of my life. I managed to get a few people on board with the project and for an event that was the first of its kind, run by someone whose entire make-up bag consisted of a stick of home-made eye-liner from back home, Alhamdulillah we did pretty well! What’s more is that every single penny made went straight to charity. We had managed to incur zero costs and we even managed to give all attendees Guess gift bags filled with donated goodies! Believe it or not, all of this took place in just one room. Back then, my involvement was packing the gift bags! The event was incredibly hectic, but the great turnout proved just how much potential it had. The next year, SnS moved to a much bigger space, and took over a whole two floors, and has been held there ever since. Huda asked me if I wanted to get involved in organising it half-way through, and with help we managed to pull off a much larger event. In 2010, SnS got even bigger. This time, I knew I wanted to really get stuck in, and there were 4 of us now on the organising team. We had a much larger 'souk' area, inviting various fashion, jewellery, and arts businesses to have stalls at our event. And biggest of all, was the SnS fashion show. Several designers took part showcasing a range of looks. 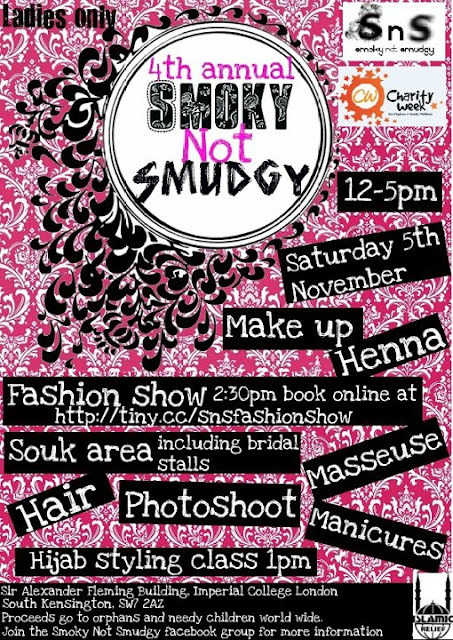 This year, SnS will be following a similar format to 2010, with all the elements of pampering, fashion, food and fun. Although I'm not involved in organising it this year, I have no doubt the girls will do a great job. Honestly, so much hard work goes into organising this event, I hope you will come down and help us raise lots of money for a good cause! Visit the SnS 2011 Facebook event for more info.